The film OPERATION RED SEA two days ago held a Beijing press conference. Bona film group chief Yu Dong, director Dante Lam Chiu Yin; producer Leung Fung Ying and actors Huang Jingyu, Hai Qing, Du Jiang, Zhang Hanyu, Jiang Luxia, Wang Yutian, Yin Fang, Henry Mak, Guo Jiahao, Wang Qiang, Huo Siyang appeared. 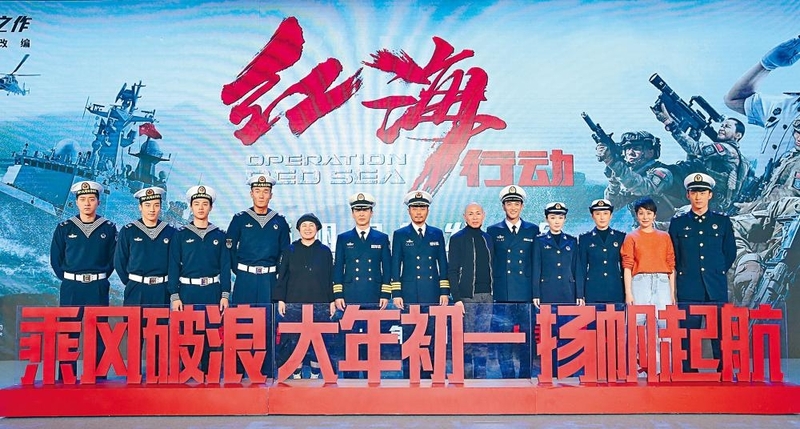 Four Hong Kong and Taiwan superstars Nicholas Tse Ting Fung, Nick Cheung Ka Fai, Jay Chou and Eddie Peng Yu-Yan all sent videos to wish OPERATION RED SEA box office success. Speaking of husband Du Jiang's hardship during the production, Huo Siyan got choked up. "Du Jiang would call me while working in Morocco. Everyday I heard how he jumped over ten meters from a building onto a tank, crawled and rolled in the desert, and my heart ached. This process also made me experience how being a soldier's wife felt. It's not easy to be a soldier, it's even less easy to be a soldier's family."